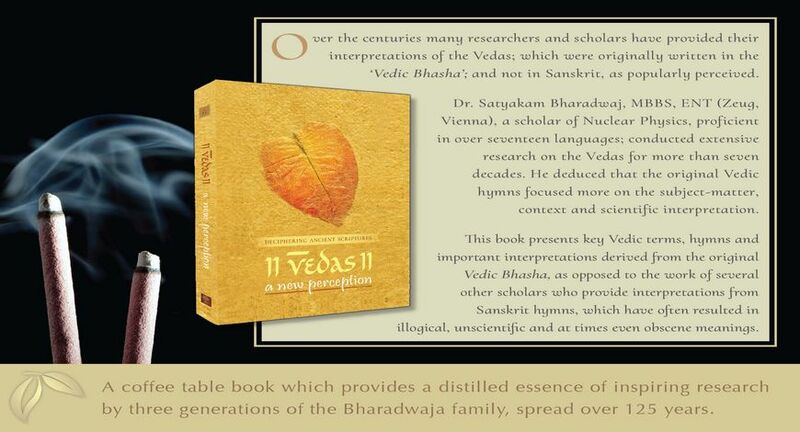 Dr. Satyakam Bharadwaj Vedic Research Foundation will launch its Coffee Table Book--Vedas A New Perception on 26th October 2018. Dr. Satya Pal Singh, Hon Minister of State, HRD will unveil the book. The author Dr. Satyakam Bharadwaj is well known for his multifaceted personality. On one side he was a medical doctor of repute while on the other hand his hobbies and interest was nuclear physics. He knew about more than a dozen languages including German, French, Latin etc and with this large spectrum of knowledge he researched on scriptures specially the Vedas. His research spanned more than seven decades and for the last four decades, he was totally involved into interpreting the Vedas in their true meaning. Dr Satyakam Bharadwaj undertook the study of Sanskrit without a Guru and won scholarships offered for superior skill in the subject. This led to his lifelong assiduous study of the four Vedas and secondary Vedic literature. In this process he realized that Sanskrit was not the language of the Veda, but was derived from Vedic Bhaasha. Thus, began his life’s true calling, the interpretation of Veda which were books of knowledge. Vedic Bhaasha is vast, flexible and subject oriented language while Sanskrit evolved to become a restricted language. He found that except for Vedas most of the scriptures, as time went by, were interpolated to suit the local beliefs. Vedic hymns often presented not only are incorrect, illogical, but also unscientific, and sometimes obscene. The book will be launched at India International Centre Annex Lecture Hall no 2, New Delhi.